Now, I should start by pointing out that this comparison video between the 2014 Chevrolet Camaro Z/28 and the 2013 Ford Mustang Boss 302 Laguna Seca has some pretty obvious issues that could be proposed by the Mustang camp. 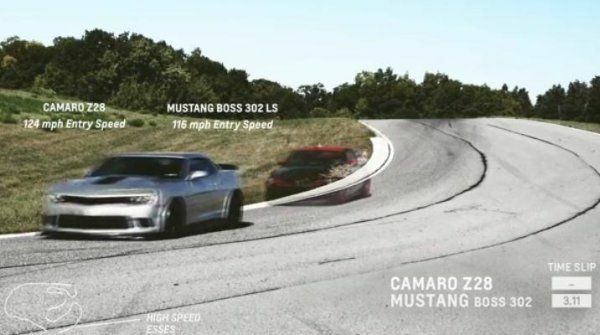 First of all, the Mustang Boss 302 in action here is a 2013 model year vehicle while the Z/28 is a newer 2014 model year vehicle that hasn’t actually been released yet. Next, the Camaro Z/28 is powered by an LS7 V8 that will offer “at least 500 horsepower” while the Boss 302 Laguna Seca packs only 444 horsepower so the Mustang is at a pretty substantial difference before the race even begins. Finally, the two American muscle cars are lapping General Motors’ Milford test track so the Camaro Z/28 is essentially competing on the very track where engineers spent endless hours perfecting this model. While the 2014 Z/28 was designed to be incredible on any track – this was the first track that the new Z28 would have proven itself on before traveling to other tracks around the world. On the other hand, the Mustang was not designed on this track and it was likely being driven by a General Motors driver who didn’t have the same level of experience in the Boss 302 as he did in the new Z/28. With all of those Mustang oriented gripes aside, this new video showing the 2014 Chevrolet Camaro Z/28 racing the 2013 Ford Mustang Boss 302 Laguna Seca is awesome. During the source of the short video, GM has added information on the screen that highlights areas in which the Z/28 beat the Boss 302. In the end, the new Camaro Z/28 finishes the lap in 1:53.71 while the limited edition Mustang crosses the line 5.3 seconds later with time lapse video technology showing the two cars in action without having them actually race side by side. The video showing the Camaro Z/28 racing the Mustang Boss 302 is narrated by Camaro Chief Engineer Al Oppenheiser, who explains why GM chose the Boss 302 Laguna Seca rather than the 662 horsepower Shelby GT500 Mustang. Oppenheiser also discusses the advantages that the Camaro Z/28 has over the Mustang and many other sports cars under $100,000, closing by saying the company wants the new Z/28 not to be compared to the Mustang Boss 302 but instead, the likes of the Porsche 911 GT3 and the Nissan GT-R. The Camaro Z/28 has also shown that it is capable of keeping up with some supercars on the Nurburgring (even when it was running in the rain) so in the hands of the right driver – the 2014 Camaro Z/28 just might give that street legal but race purposed Porsche and the AWD Nissan supercar a real run for their money.